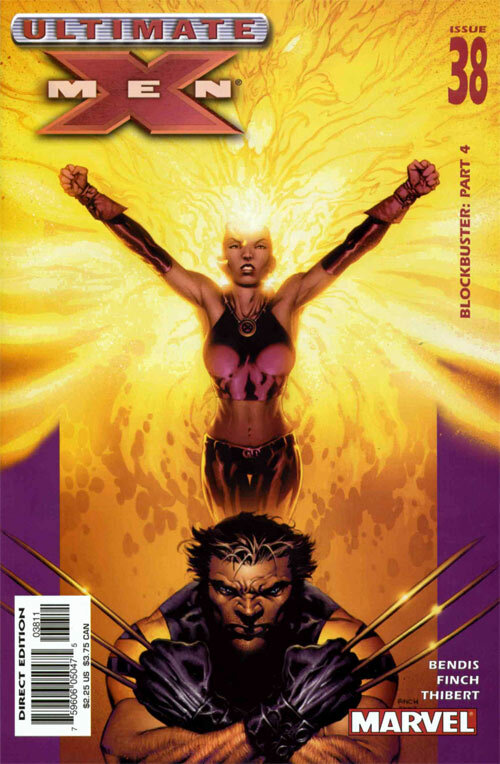 Issue opens with Angel and Wolverine in the Danger Room. Angel wants Wolverine to train him so he can fight better. Once the claws snikt out, he gets scared and wants to stop. Wolverine ends the session by showing how in control of his claws, he is. Wolverine smells a familiar scent. Fury is talking to Xavier while Storm, Jean and Cyclops listen. Fury wants Xavier’s help with a delicate situation. Wolverine was attacked during Bendis’ Blockbuster arc and Fury believes he knows who may have been behind it. He believes there is a fraction of high rank government officials. 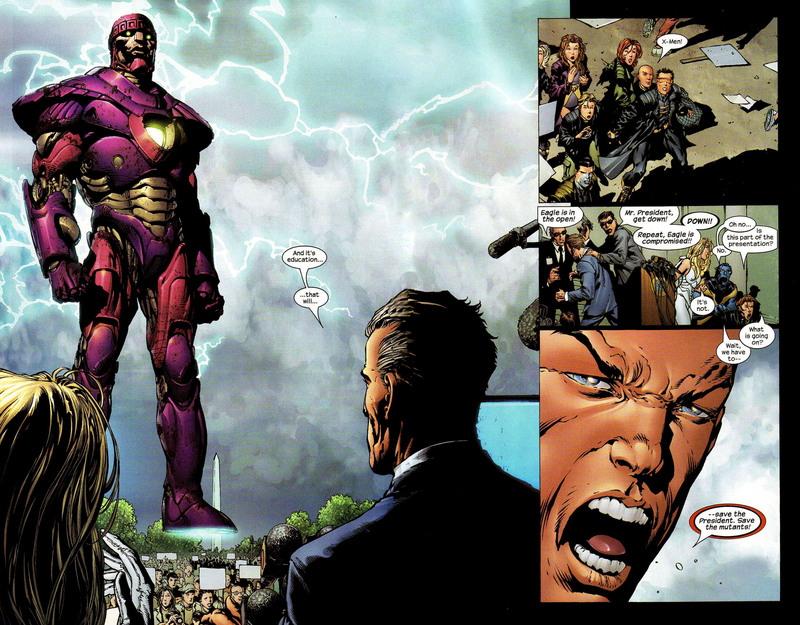 The fraction under the impression that Xavier may be manipulating the President, as Xavier manipulated the world into believing Magneto was killed on live television. The President is Pro-Mutant now, and they find that suspicious. There is an ad for Encore’s Daredevil video game, that never came out but I wish it did. Fury knows Xavier isn’t doing any of that type of activity. Fury isn’t able to confront this group directly. The group has high ranked military officials. Fury can’t make a move without proof. If he did, he risks being decommissioned, detained or even, court martial-ed for treason. Worst, the group could go back into deeper hiding. Fury can tell Wolverine is behind the door. What is bringing all of this to a head is, the President is going to announce a new mutant education program. 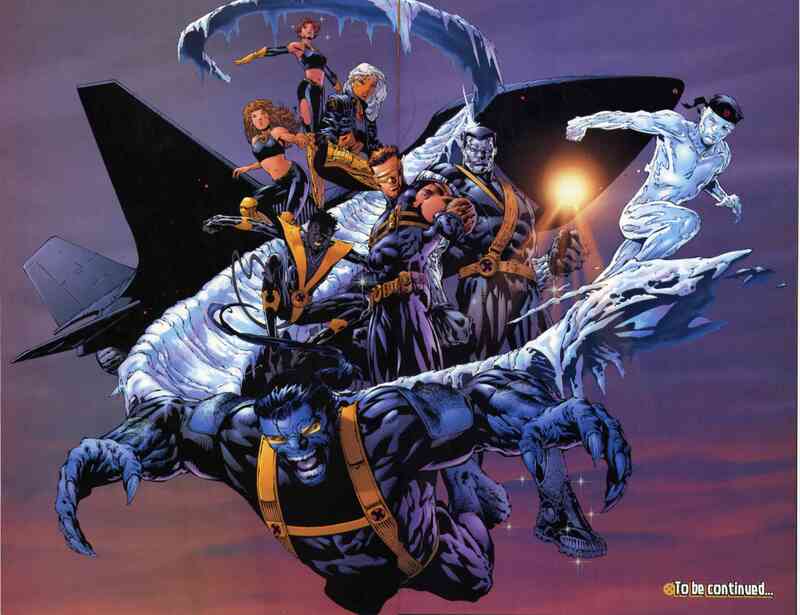 He has a group of young mutants, who are lead by Emma Frost – who Xavier has a history with. 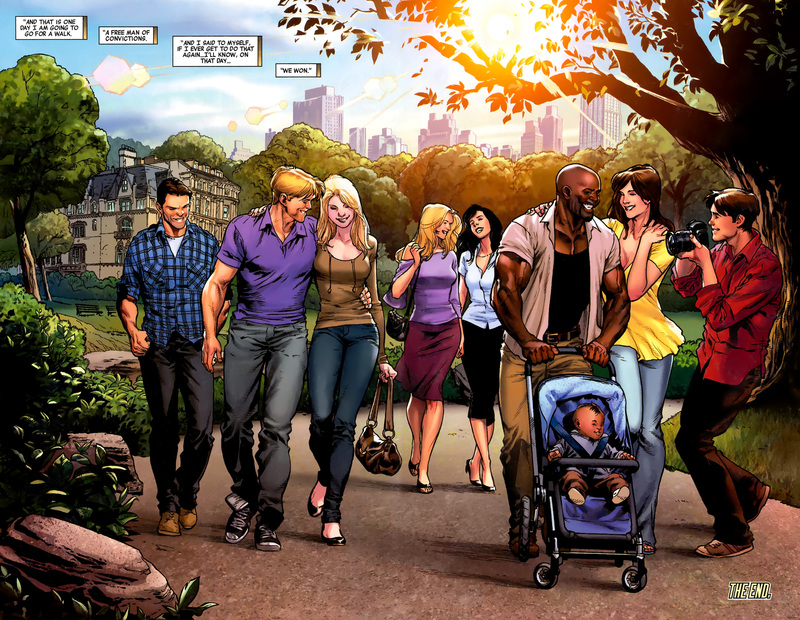 In the Ultimate Universe, Xavier got himself around. The President is trying to distance himself from Xavier. 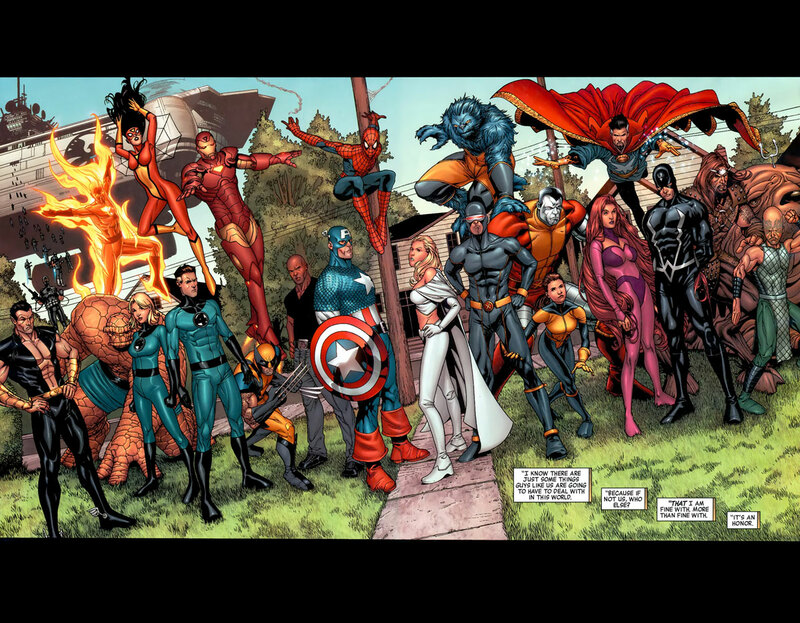 The students are Beast, one of Fury’s trainees and Havok – who Cyclops doesn’t keep in touch with. Xavier wants to know what he should be doing about all of this information. Fury can’t confront the group and he can’t warn the President without tipping the group off. He can’t have his people make a presence as that would alarm the group. Fury can’t, legally, enlist the X-Men, as they are civilians. The President is holding an outdoor press conference on the steps of the Capital Building to announce the new agenda. Fury is worried about the President’s safety and the safety of the students. His hands are tied and he can’t tell Xavier Xavier about any of this. He wants to know what Xavier is going to do. The President is making his speech. The President (Bush 43)’s face is covered as the policy in the Ultimate books is to try to keep the comics evergreen, which is silly. I get, like with the original Spider-Man clone saga, that there is a scene where President Ford makes a speech, which instantly dates the comic. But how many winters have passed in the Ultimate Universe? Marvel is so silly with their sliding time scale but they are stuck with not wanting to lose their properties. Next to President Bush is – Emma, Havok, Beast and two unnamed ladies, one looks like Dazzler. Marvel Database confirms Dazzler and the other is Karma, which makes sense with what I know is to come in this title. There is a kid in the audience who recognizes the X-Men and asks Kitty why they are not on the stage. He is a big fan of theirs, as they are awesome. A Sentinel arrives, the President is moved to safety. Xavier shouts to the X-Men to save the day. The Sentinel eye blasts the steps and Beast is struck. 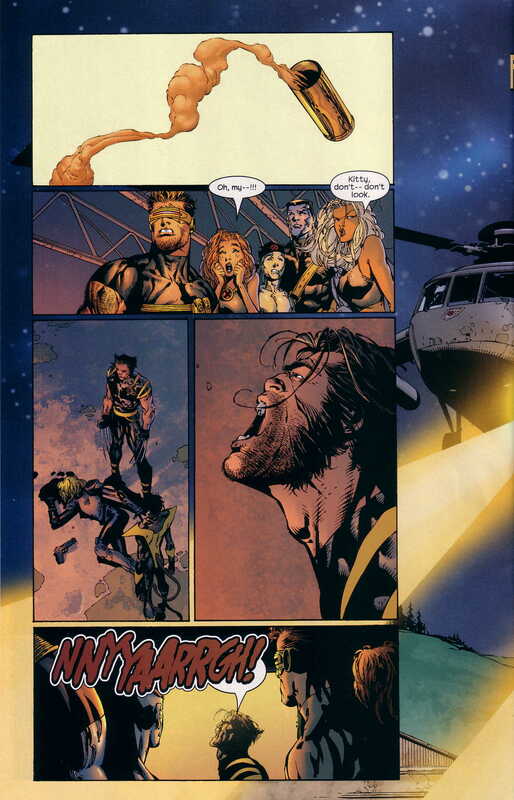 Wolverine tells Angel to fly him up. Angel learns how heavy Wolverine is and can’t fly up high enough. Issue ends with Beast dead for the first time, he will come back in like twenty issues and will die in the first issue of Ultimatum. 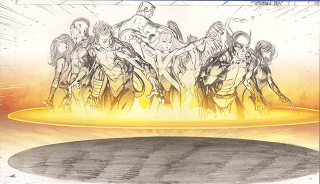 The Second Ever X-Men Letters Page has letters from – Lindsey Douglas of Myrtle Beach, SC / Patrick Guaschino / Roland Shum / Ann Nichols of Sierra Vista, AZ / Hubert Tyrelle of Charlotte, NC / Adam Weinstein / Craig Yoshihara of Atlanta, GA and finally, Ame and Eric. 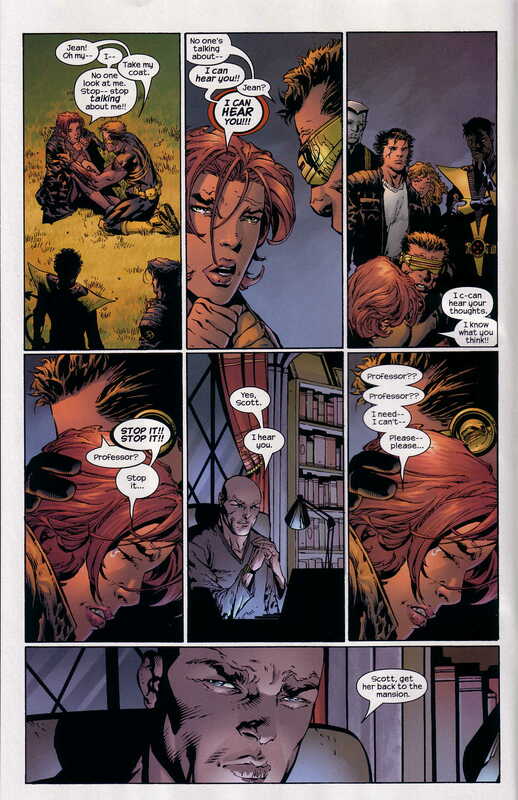 Eric wrote a letter that was printed in Ultimate X-Men, wherein he proposed to Ame and on this page, we are told that she said yes. Congrats you too! That is a pretty cool! The back cover ad is for the Thomas Jane Punisher film, which I still really like. I like how, if you combine this film with Punisher : War Zone, you essentially get the Welcome Back, Frank storyline by Garth Ennis and Steve Dillon. I got it for the excellent David Finch sketch covers for the first chapter. There are other features such as a short story. Lists of trades. Also a Phoenix brief history. Jean wakes up in a meadow that has to be miles away from the mansion. There is an ad for X-Men 2 coming to DVD. Kitty and the team are running to Jean. Cyclops tries to comfort her. 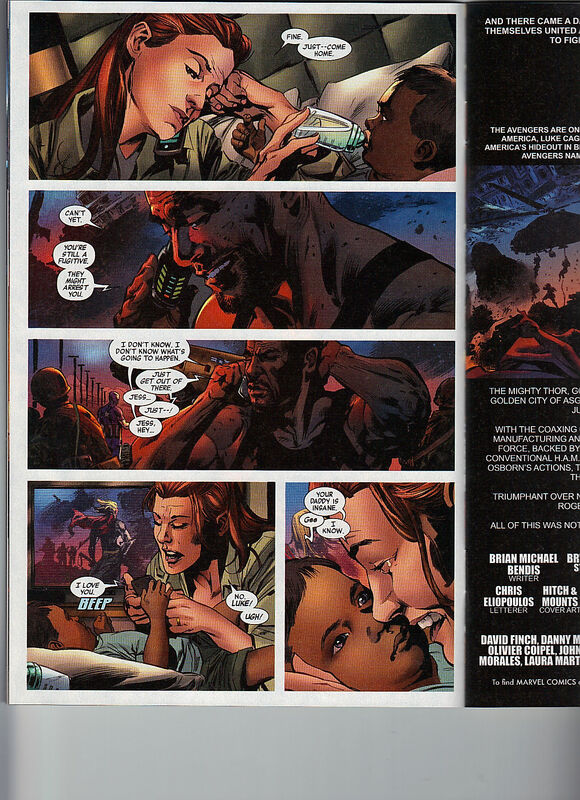 I’m pretty sure that Bendis doesn’t get to write Kitty saying anything at all in these three issues. Which is a shame. Jean can’t believe she killed people. Cyclops tries to console her that they were horrible bigots and maybe didn’t deserve to die but are dead and thus, life will be better now. Xavier tells Nightcrawler to teleport Jean to the Mansion. Xavier is going to make her feel better. Nightcrawler gets back with the team. 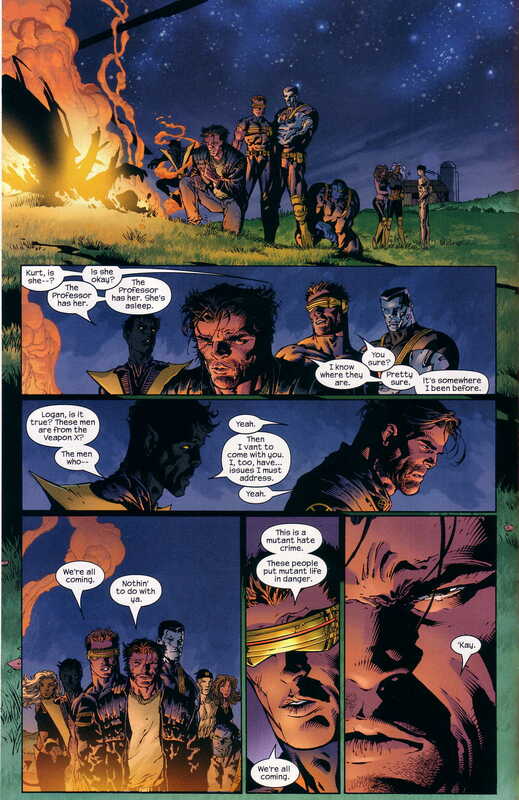 Wolverine knows where the mercenaries are. Nightcrawler wants to help as he has unfinished business with Weapon X. Cyclops tells Wolverine that they all will go. Which isn’t what Wolverine wanted in the first place, but it is what he is going to get. I really like how thick Nightcrawler’s German accent is, as he pronounces words with a v instead of a w. It is a small detail but it makes the character stand out. The mercenary lady leader is being grilled via Skype (or whatever Skype was back in 2004). They are cancelling the mission and letting the team go. They have been, not only reckless, but careless. They had gun fights in the middle of New York City, and people are going to figure out that something isn’t right. To make the situation worst, now Wolverine has the support of the X-Men now too. There is a great moment when he spells it out to her, that if you attack Wolverine, then it is an attack on the X-Men, which is an attack on Xavier, which means it is an attack on Nick Fury, which is an attack on the Ultimates, which is an attack on President, which is an attack on America. Which is treason. These mercenaries are silly and have no idea what is going on, on the larger stage. She tries one last attempt, telling the guy that this is war. He rebuts her with, yes and you are a casualty of it. Which is another great line. This ends their business arrangement. Then begins the lead up to the conclusion of the storyline. My favorite part of this is how the computers start to freeze and then we see the breaths of the mercenaries. Very cinematic! The X-Men come storming through the door. Kitty isn’t seen on this page, which is a shame! The lady leader lifts her gun and we see her take four shots. I didn’t quite get the moment until the X-Men respond to it. Storm tells Kitty not to look and it finally works for me. She shot her teammates and then she killed herself. 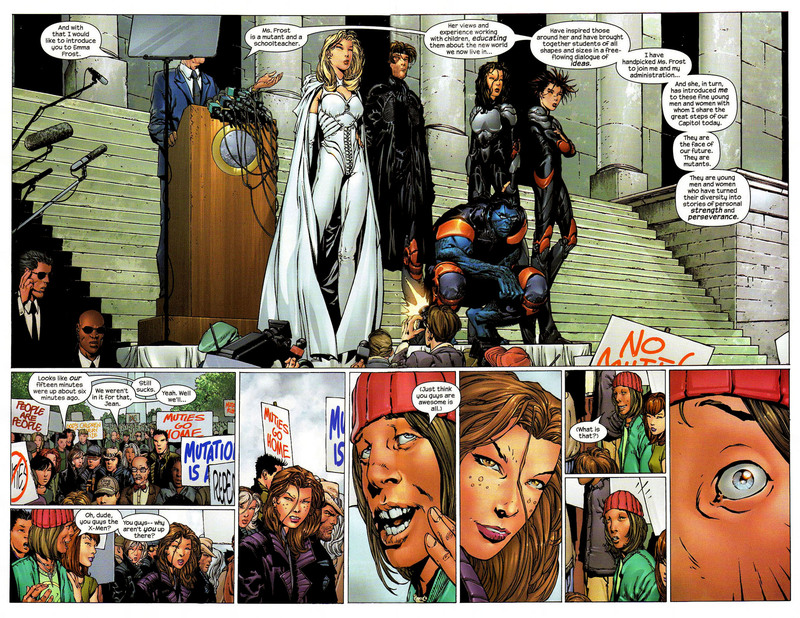 Kitty’s “oh my” is technically Bendis writing Kitty Pryde. I like how it is Storm who tells her not to look. Trying to protect Kitty as much as she can. Wolverine lets out a scream, in frustration. Of course, just then, SHIELD shows up. Leading the newly created Mutant Ops Division is good ol’ Dum Dum Dugan. I like how once ORIGIN came out, everyone just started calling Wolverine, James – I tried to on certain message boards and was told to stop. It was an easy way to show that these characters were either from Wolverine’s past or that they had secret information on him. It did bug me that, of course, now they can call him James – but that’s just how sequential storytelling works. I like Dugan in this scene. He wants to do what Fury does and tell them national security and let that be what it. But he wants to teach these kids that they are silly silly kids, playing adult games. He tells them how, because they froze the computers, they can’t retrieve any information out of them. Because they didn’t listen to Fury to stay at the school, these mercenaries are dead, so they can’t question them. 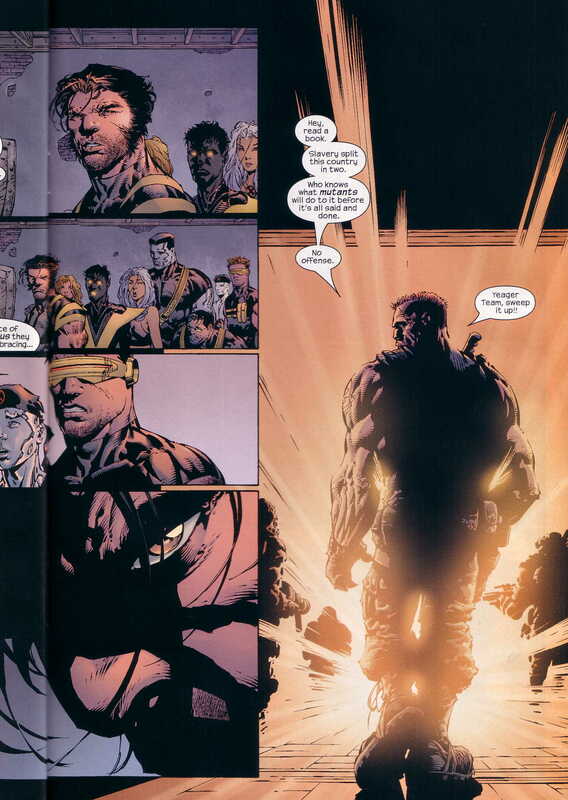 Which leads to a great moment of Cyclops telling Dugan that they were not given any such orders. Dugan realizes, quickly, that Xavier and Fury have a communication issue. Dugan reveals that there is clearly a conspiracy involving high ranked government officials, as the information they had could only come from those types of people. Not sure where that story gets picked up later, if it does at all. Before Dugan leaves, he tells the team how having Wolverine on the team and on covers of magazines, pushed some buttons and that they are going to have to deal with that. Wolverine, not a good person. Issue ends with Jean in her room. She is having a conversation with someone. I didn’t pick up on this the first read through, but it isn’t Scott as he comes in asking her who she is talking too. Scott has brought her some food and Jean has to suffer in silence as she may be going crazy – again. They look out her window to see Wolverine. He’s all sad face and looking at a ring in the palm of his hand. Was the lady mercenary telling the truth that she was his wife? dun dun dun! Thus ends Bendis’ first arc on Ultimate X-Men. I do own issues from his second and final one, New Mutants. I do own issues from that, but we will review them some other time. I own parts 1, 3, 4 and 6. This is the final issue of Ultimate X-Men I got for Father’s Day from MileHighComics.com. I wonder how embarrassing it is that the cover shows Part 4 when it should be Part 5? Who does that fall on? Speaking of the covers, I wish they took more time to do story covers and not just iconic covers. Ultimate Spider-Man was the worst at that, as much as I love Mark Bagley, but it was either a cover of him standing on something or swinging by something – for the longest time. At least on Ultimate X-Men, the characters match, for the most part. 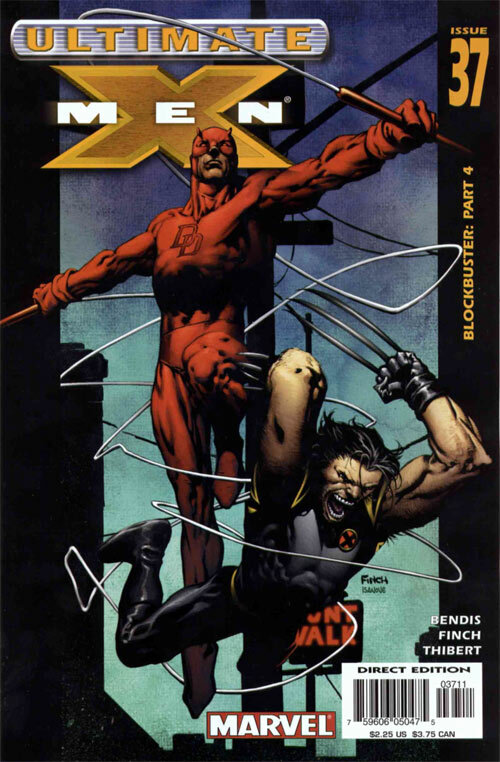 This cover isn’t the best example of that as it is essentially a Jean / Wolverine issue. This issue opens with Wolverine, reliving his ‘first’ memory – which is him waking up right after the Weapon X procedure. He is reliving this moment, thanks to Xavier. Xavier knew Wolverine wouldn’t ask for help, so he started without him. Wolverine is punishing himself for his recent actions involving Scott. Xavier has a gut feeling that eventually, these mercenaries are going to come for the X-Men, or involve them somehow. The reason they are revisiting this is due to how the mercenaries know about his Weapon X days. Logan is impress that Xavier has been able to pull these memories up as he thought Xavier couldn’t do that. Xavier tells him that he has been working at it for 12 hours and has quite the headache. Wolverine recognizes the female leader, as she was present at the procedure. They now know that the mercenaries are recent decommissioned Weapon X soldiers. Next, they talk about why Wolverine left. The team forgave him and all are willing to work with him again. Cyclops was eve the guy to extend the invitation. Wolverine could hear the whispers and smell the tension. 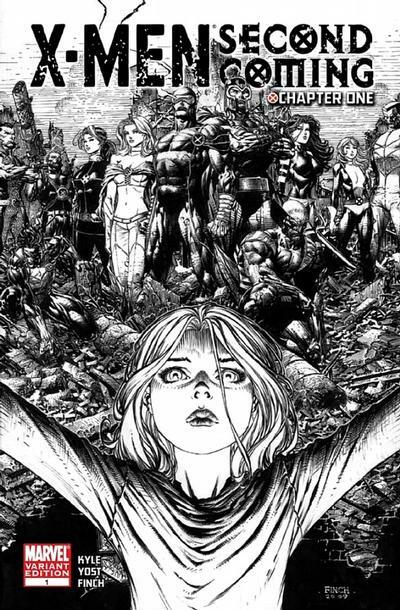 The X-Men forgave them with their heads but their hearts are not there. Xavier calls him a fool, that of course he will have to rebuild relationships and trust – no one is going to want to be on a two person team with them. Heck, Cyclops was on a three person team and was still left for dead! Xavier has a nice moment, when he reminds Wolverine that the X-Men are still children. Teenagers with all sorts of emotions. They deal with highly adult themes and content but they shouldn’t forget that only Wolverine and Xavier are the adults in the mansion. Xavier’s next step is to call Fury. For some reason, the two of them are communication through a screen. But not just any screen, but multiple screens. Which must be very confusing as the audio must be coming from all twenty of those as well. They should try to transfer it so that their image takes up all twenty screens. Or just communicate via the middle one. It doesn’t look cool either. Fury straight tells Xavier that he is going to handle it and dismisses him. Xavier had follow up concerns and questions but those don’t matter. Wolverine enters the dining area. Is it just me or is that table way to small and impractical for the team? It needs to be longer. The death glare from Jean to Wolverine, will come back! Next, we see him eating outside. Did he make his sandwich is complete silence and found a spot to sit? That must have been super awkward. Jean goes outside to harass him. If he even thinks about her, she will rewire his brain. 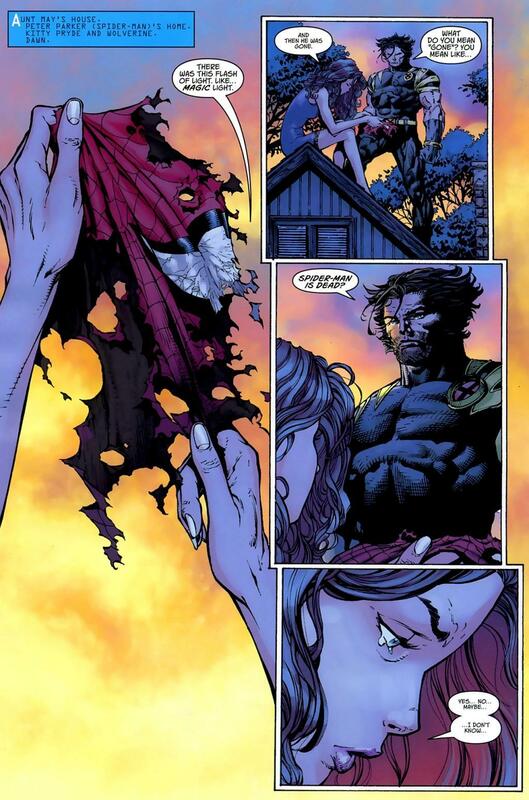 Jean will never forgive Wolverine for what he did to her and Scott. She even let him into her sacred spot. She has more to say but becomes distracted. We see two pilots on their way to the school. They are mercenaries and their leader tells them to retreat as clearly they have been spotted. They don’t listen as they are dumb men. They want to kill some mutant filth. That expression sets off Jean and she straight up destroys the helicopters, most likely killing the scum pilots. When she does this, the Phoenix bird can be seen in the sky. Issue ends with Logan in shock and Xavier saying, oh no. If only he said, oh boy, that would have been pretty cool. One last issue for us with Ultimate X-Men’s Blockbuster conclusion! Apple Jacks is really owning these back covers. This time, they are asking us to choose what the next shape should be. So silly but it works, I bet. The North Pole. Magneto is preparing his master plan. Sounds like what he will later successfully accomplish with Ultimatum. The Citadel’s Infirmary. Cyclops wakes up and starts optic blasting dudes. There is an ad for the latest Pokemon games, Ruby and Sapphire, for the Game Boy Advance. Cyclops is in tighty whiteties. The Citadel, 0200 hours. Magneto steps into the device that Forge created to amplify his powers. Think a higher production version of the machine from the first X-Men film. Magneto states that the power increase is that of a pocket calculator being made into a super computer. He cam erase tapes in Japan and can change the weather in Hawaii, at the same time. Magneto sends troops to where Xavier is being kept prisoner. One of the Sentinels says, oh God, which why would a robot be programmed to have that reaction? The Brotherhood take Xavier to Magneto. He would hate to see his old friend die with all of the humans. 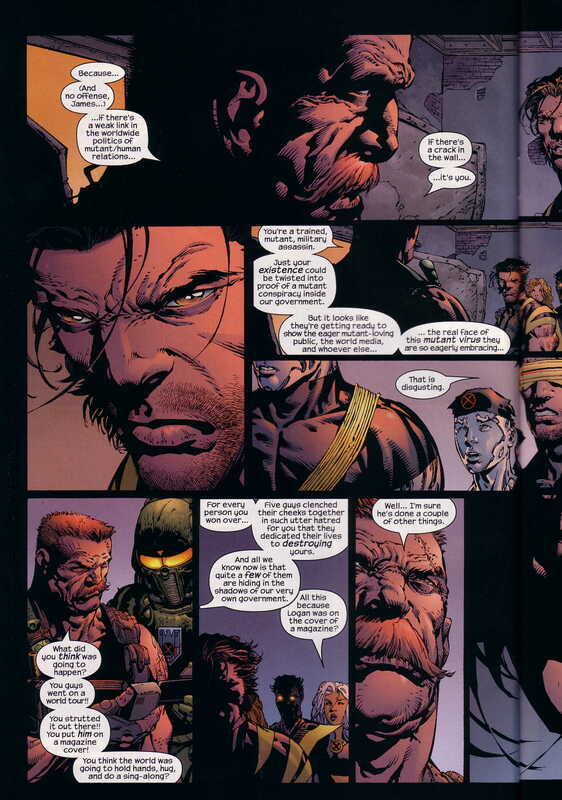 Sabretooth mentioned earlier, how it is a shame that dogs and cats have to die as well. Magneto assures him that an ark was created to keep some animals alive. 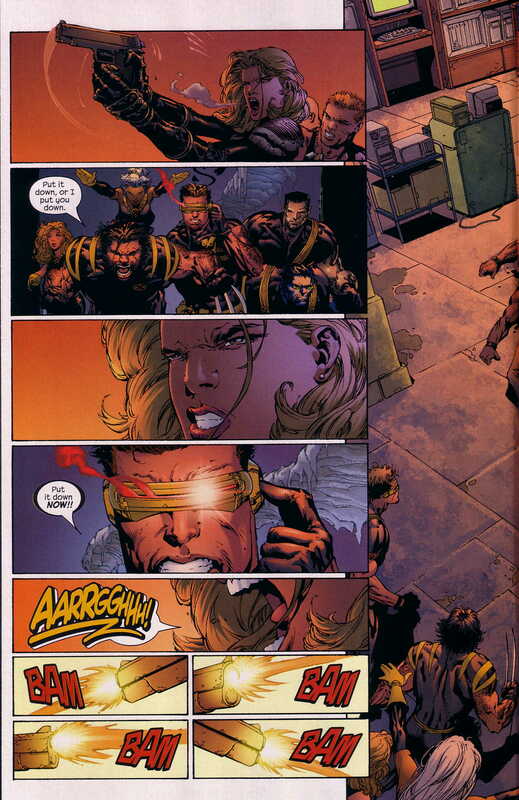 As Magneto is about to perform the death strike, Cyclops optic blasts him from behind. Still in his underwear. Magneto starts to taunt Cyclops and call him names for being alone. 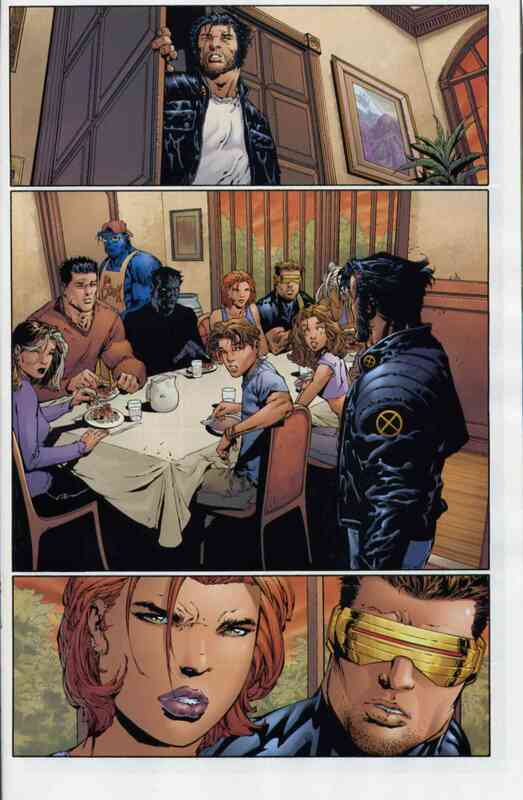 Cyclops gives the awesome line of not being alone, as the Blackbird crashes through the window. I really like how we were not given any hints of the cavalry was on the way. Scott and Jean continue their cute, Mr. Summers / Ms. Grey routine. Wolverine cuts Sabretooth’s head clear off. Cyclops gives Kitty the order to tamper with Magneto’s machine. Which she successfully does. Magneto, in a last ditch effort, destabilizes the core of a nuclear reactor in Miami, Florida. The East Coast is set to be destroyed. 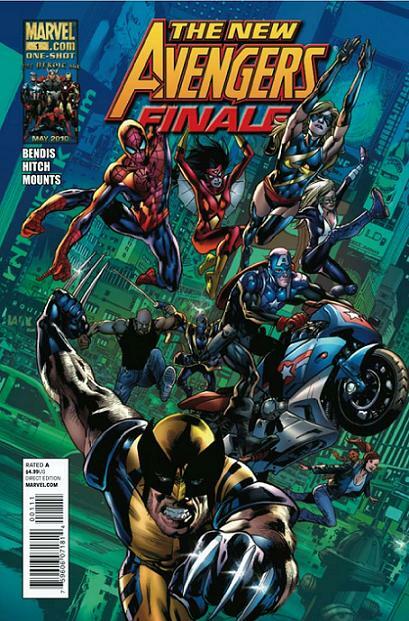 Ultimate Giant-Man makes the cover but not Shadowcat? Ridiculous! 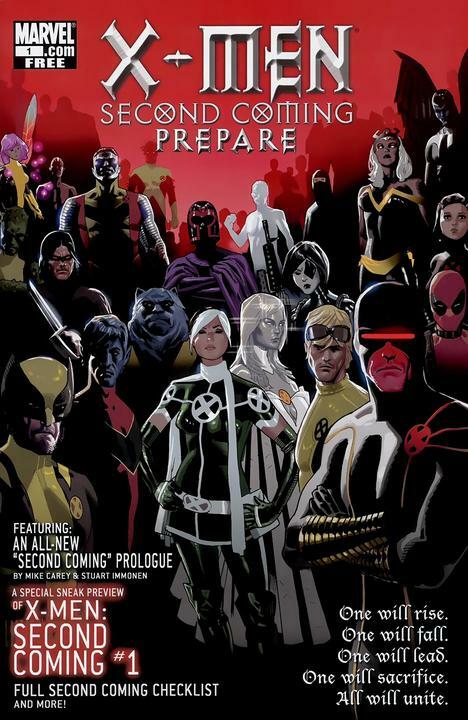 Since this is only the second Ultimate handbook, all of the big names are also spotlighted that are in the Ultimates and Ultimate X-Men teams. 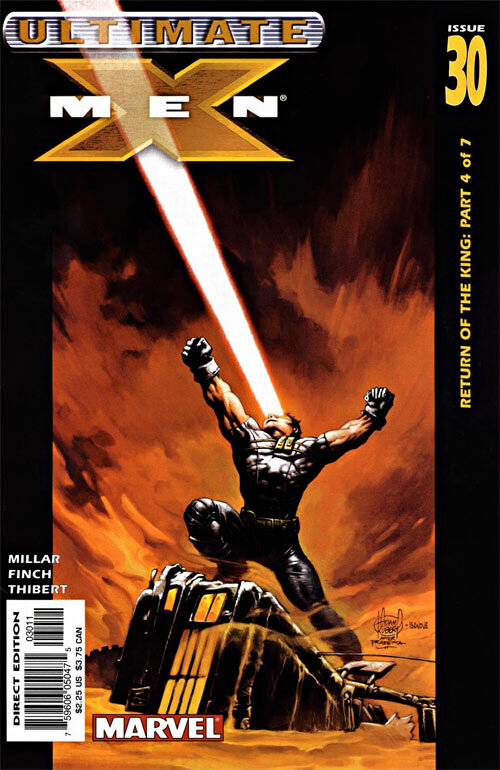 I had to add Ultimate X-Men 18 to my wishlist as apparently Illyana Rasputin is named in that issue, I learn that as she is listed in Colossus’ relatives. I thought he just had unnamed siblings. Kitty is referenced in Iceman’s profile as well as Longshot’s. 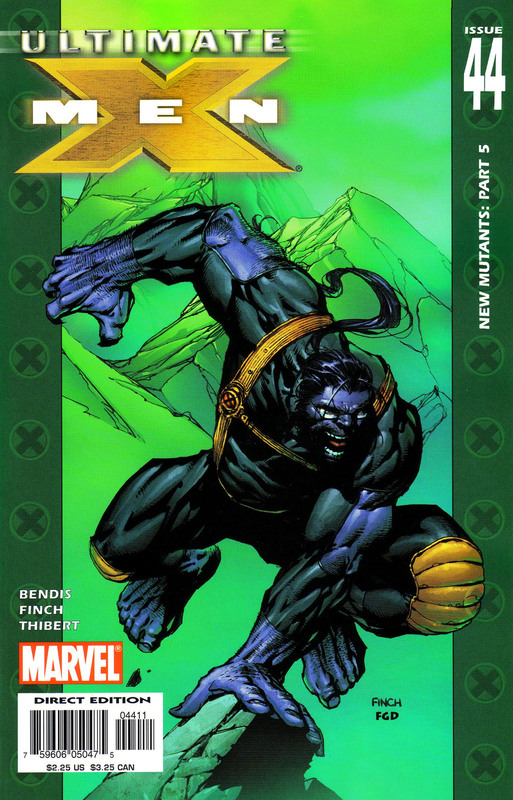 Rogue’s profile has a reference to Shadowcat, as well. There is a handy issue checklist in the back. This brings us to the end of Ant-Man Month, it was more of an Event than a Month but what that’s how these things happen. Please come back soon for . . . FANTASTIC FOUR MONTH! This may be the worst way to end Daredevil Month but that’s just how the order came about. Daredevil doesn’t appear at all in this issue. 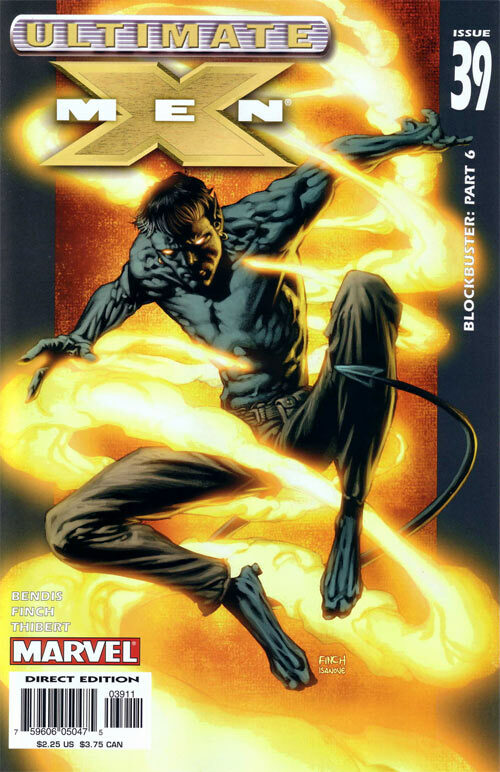 For Daredevil’s fate in Ultimatum, read 131, Shadowcat doesn’t appear in that issue, so I no longer own it. 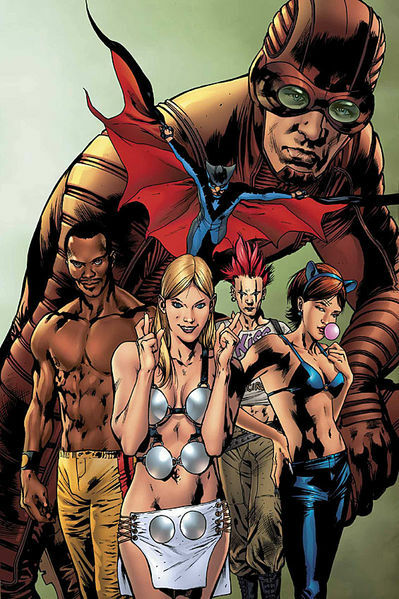 This cover is part of a larger image. According to this website’s reading order, it goes Ultimate Spider-Man 132, Ultimatum 4, Ultimate Spider-Man 133 – so that explains roughly, the whereabouts of Shadowcat finding her ex-boyfriend’s mask. 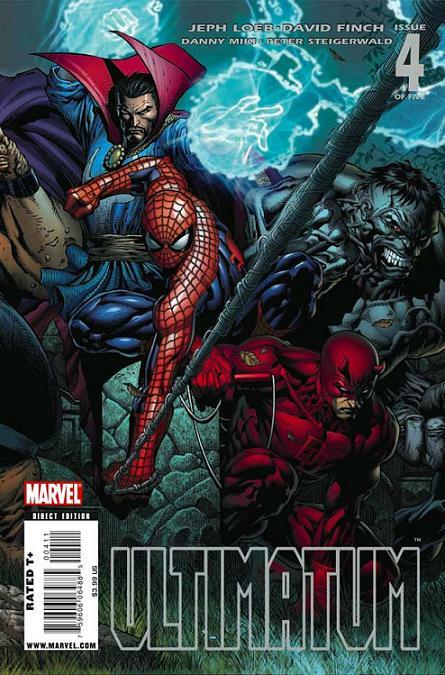 So, of the main tie-ins and such, I own Ultimatum 1, 4 and 5 / Ultimate Spider-Man 132 and 133 / X-Men Requim. I’m sure I own some of the build up issues but these above, I could verify. I know I own Ultimate Spider-Man Annual Three and X-Men / Fantastic Four Annuals, that have the Ultimatum banner. 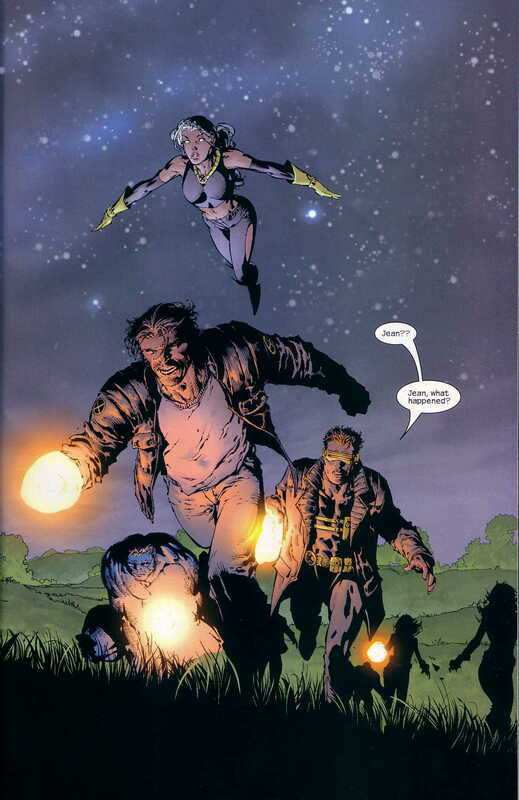 That is one of the great things about Ultimate Shadowcat, she makes appearances in these Ultimate events. She will be a major figure Post-Ultimatum, but she was in prior ones as well. One of the huge criticisms of this series isn’t the death toll but how gruesome the deaths are. Unnecessarily so. Inside front cover ad is Hugh Jackman as Wolverine Milk ad. This is to tie in with Wolverine Origins. 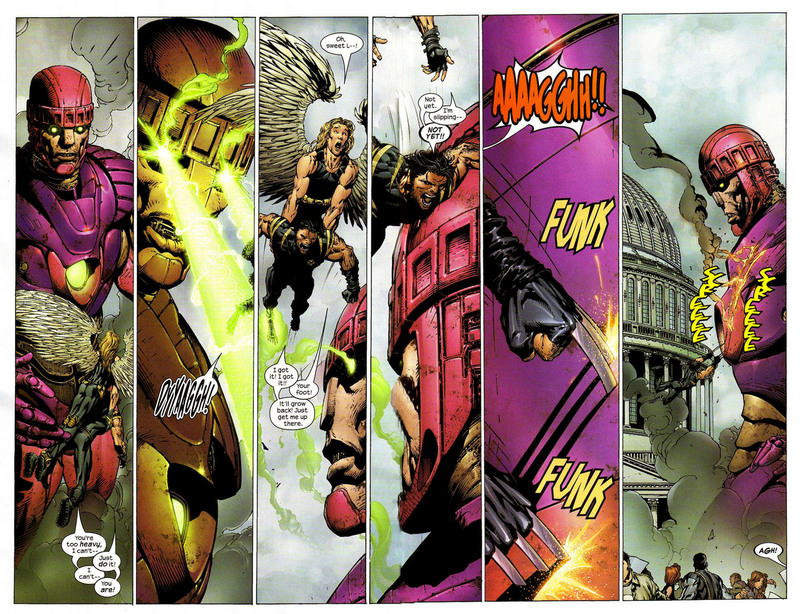 What I like about Ultimatum is, no matter what, Magneto won. The series starts with him spinning Earth on its axis, causing catastrophic disasters. The world will never be the same again. Unless there is a one year time jump and the world has mostly returned to the same. Except humans have a very real reason to hate one specific mutant. Heroes who have died in this event, prior to this issue – Dazzler, Wasp, Giant Man, Thor and Nightcrawler. Thor will come back, eventually. I’m not sure how, as dead was meant to mean dead, in the Ultimate Universe. Which for the most part, is how it has been. Which is why this was a real turning point. The home of Doctor Strange. Sorcerer Supreme. Soho. New York City. Spider-Man and Hulk. That Night. Spider-Man warns Hulk to not destroy Strange’s home as it keeps the mumbo jumbo inside. Hulk smashes mumbo jumbo. Oh Hulk. There is a giant explosion and Spider-Man passes out. Kitty Pryde. Soon after. Poor Shadowcat finds her ex-boyfriend’s mask. As news reports come out all of the death, Shadowcat makes the assumption that this mask means Spider-Man is dead. Dormammu is fighting his old enemy, Doctor Strange. Nice that we get a quick recap of Ultimate Strange’s origins. He is part of a long line of Sorcerer Supremes but he is the last in the line as he’s still pretty young. Dormammu has taken the Human Torch prisoner, as well. 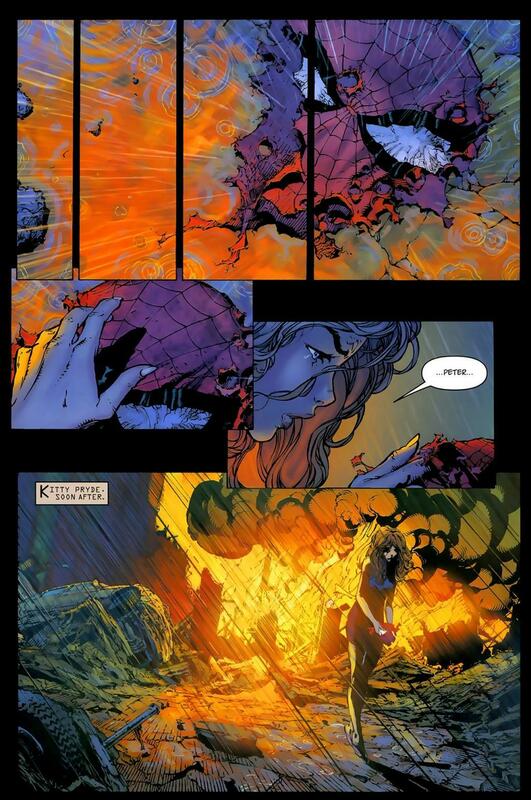 Dormammu wraps a cloth around Strange and strangles him, we actually see his head explode and his headless body. Invisible Woman and Thing show up, too late for Strange but hopefully not to late for her brother. Lower Manhattan. Hulk and X-Men. That Night. Hulk was trying to help Strange (I’m not sure how) and he is being chased by both the Army and Cyclops and Storm. The X-Men are leading him straight to Wolverine and Jean Grey. Hulk recognizes Wolverine from that time he ripped him in half. Wolverine hopes to not repeat that. 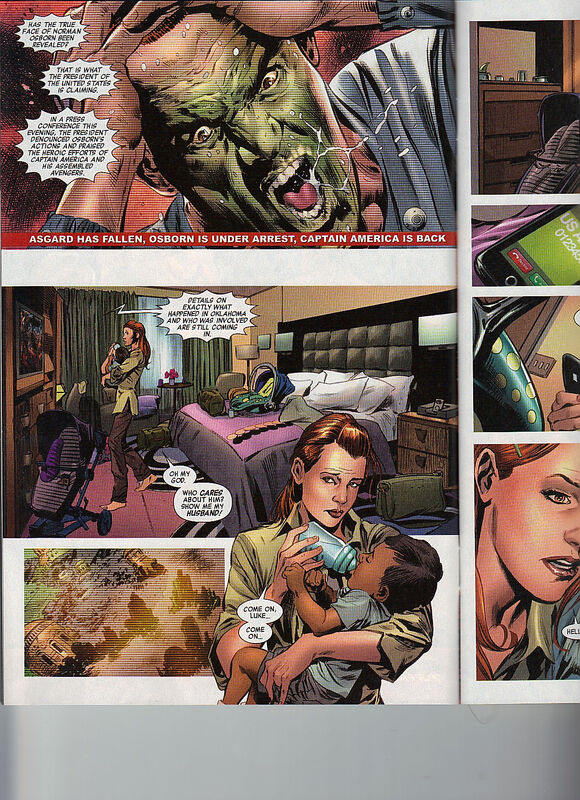 Jean calms the Hulk down, now that he is distracted. At some point, the Hulk lost his pants. The White House. The Supreme Power Universe. Nick Fury, Exiled Head of SHIELD. Reed Richards, Doom, Zarda and Arcanna. Time Unknown. So this takes place after Ultimate Power, the crossover between Supreme Power and the Ultimate Universe, it ends with Fury over in that universe. Supreme Power was like the Ultimate Version of the Supreme Squadron’s universe – which isn’t complicated at all. Arcanna is an Asgardian. They are there to bring Fury back to their universe. Well, this is Zarda (Power Princess) universe but I believe we traded her for Fury. There is an add for Wolverine Origins, the video game, which I highly recommend on either the XBox 360 or PS3, the PS2 version was a lesser version in every respect. Reed explains to Fury that Magneto tilted the Earth on its axis and now they need him to fix it. Fury knew something like this would happened without him in charge. Fury makes Doom explain his part in this. 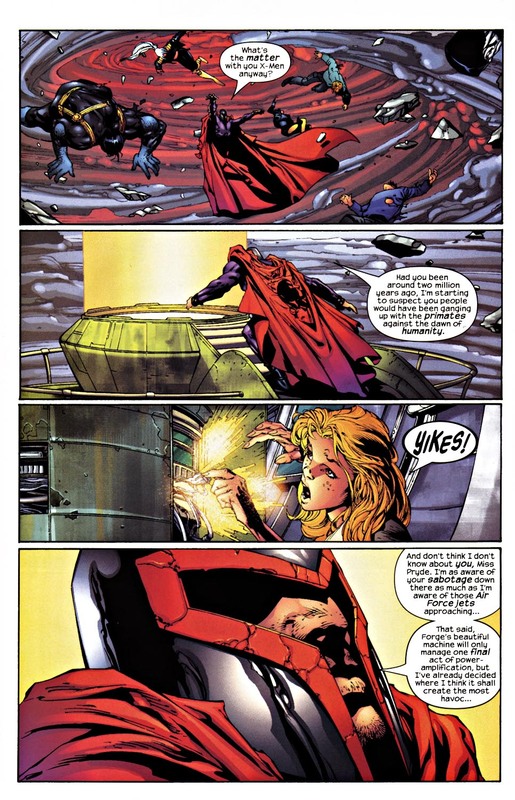 Damme had Scarlet Witch murdered, so that set off Magneto. This causes Reed and Zarda to attack Van Damme. 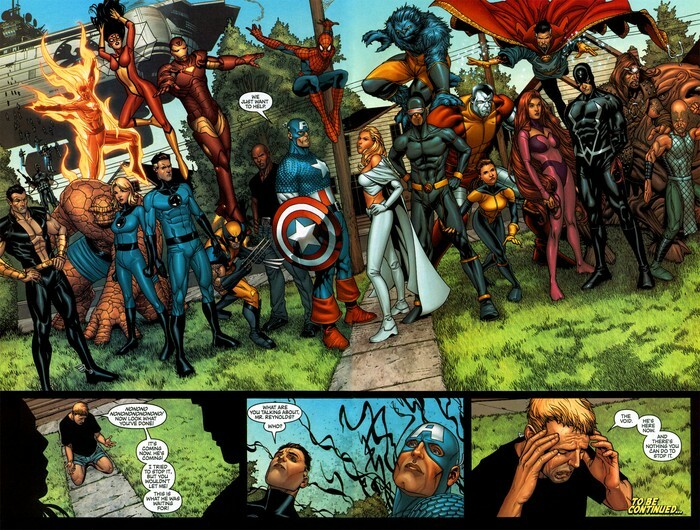 Arcanna gets everybody back to the Ultimate Universe. Aunt May’s House. Peter Parker’s (Spider-Man) home. 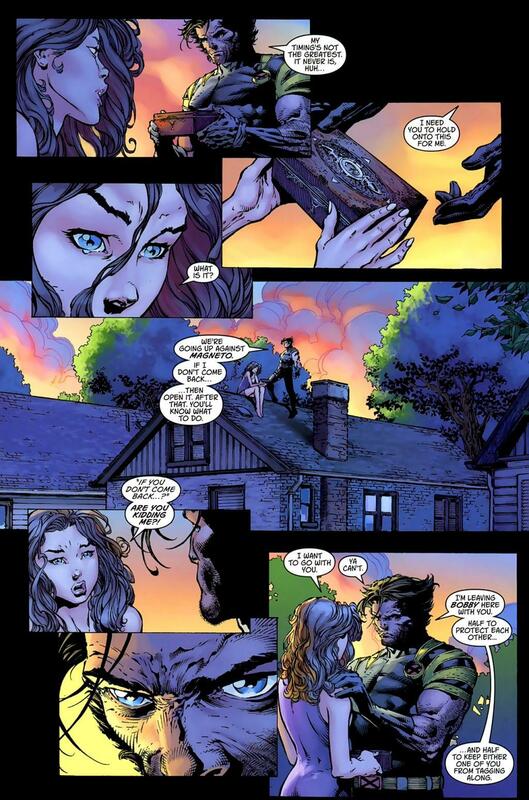 Kitty Pryde and Wolverine. Dawn. This is probably my favorite scene in this event, as this saves Shadowcat from death that the next issue brings. 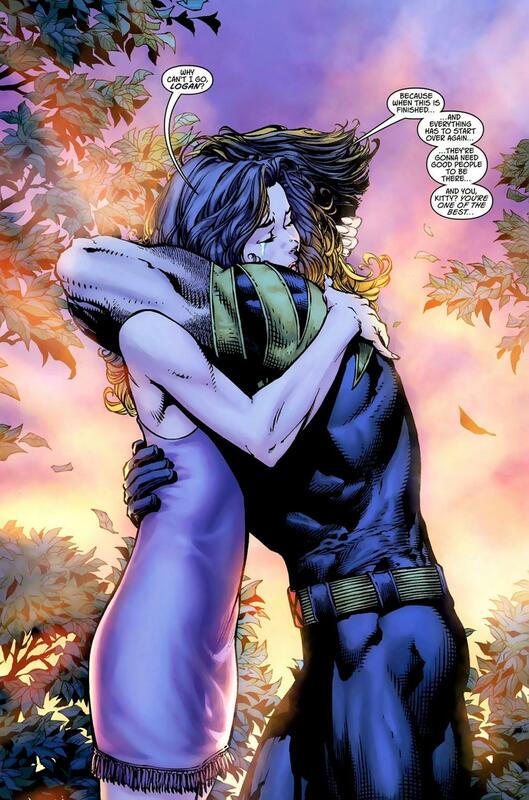 Kitty and Peter’s relationship also brought her to the main stage and took her out of the X-Men, for a time, which saved me from some bad comics. The big battle is coming and this is the calm before the storm. Kitty explains there was a flash of magic light and Peter was gone. Kitty isn’t sure if he is dead or not. Wolverine gives Kitty a box, if he doesn’t return, she is to open it. Kitty, being an uncanny hero, wants to be part of the big battle. Wolverine wants her to stay behind and take care of Iceman. Finch does draw Kitty way too skinny here but that is a great image. Wolverine really doesn’t want her to come along as, once this is over, she needs to be part of the rebuilding process. Kitty is one of the best (I would have said the best, but that is me) and they hug one last time. Or possibly, for the first time. Magneto’s Citadel. Above the Artic Circle. Morning. Once again, if someone is quoting scripture, it comes off insane. Plus, Magneto is narrating to himself so that’s not a good sign. Angel comes busting through the window and gets a punch in. Magneto sends Sabretooth to fight Angel and Sabretooth violently steps on Angel’s head, killing him. Hawkeye fires an arrow into Sabretooth’s right eye. Magneto is running around with Thor’s hammer (I believe anyone can pick it up, if you can get it away from Thor). Arcanna wants the hammer back but she brought a big metal sword to a fight with the Master of Magnetism. She does get a great hit in, in that she slices off his right arm – that was holding the hammer). He takes the sword from her and slits her throat with it. She’s an Asgardian, so she is still standing there when Captain America busts through another window, claiming this is over now. Magneto rushes away. 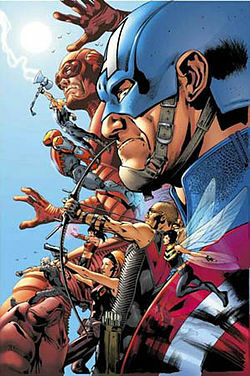 His path is blocked by Beast, Cyclops, Jean Grey, Hawkeye, Iron Man and Storm – as the issue ends. 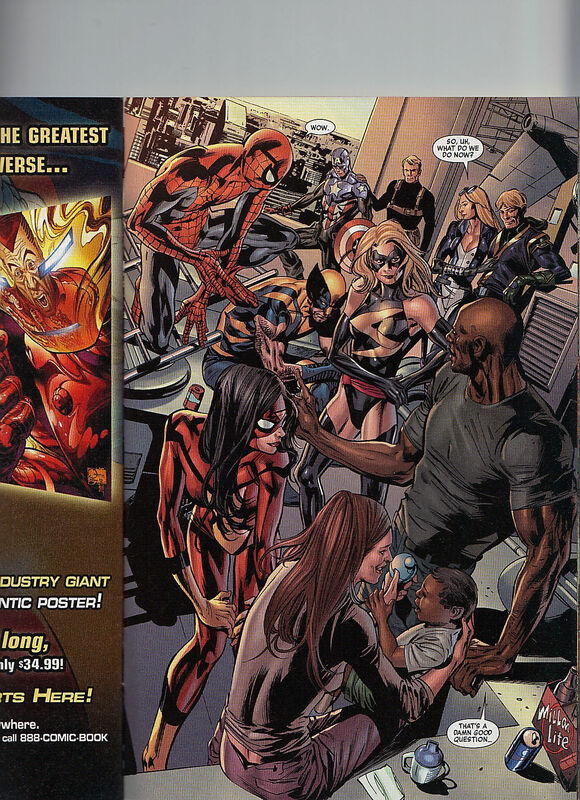 Ultimatum is continued in Ultimate Spider-Man 123 (which is a misprint, they meant 132. Shadowcat isn’t in 123 so I don’t own it but I do own 132) and I own 133, the last issue of Ultimate Spider-Man until that title’s third relaunch and they renew the numbering for the big 150th issue. Ultimatum concludes in issue five, which I also own. Then there are aftermath issues, Requiem : Spider-Man / Fantastic Four / X-Men, I only own the X-Men issue. We’ll get to these issues eventually. For now, Daredevil Month has concluded. Come back tomorrow for . . . . AVENGERS MONTH! 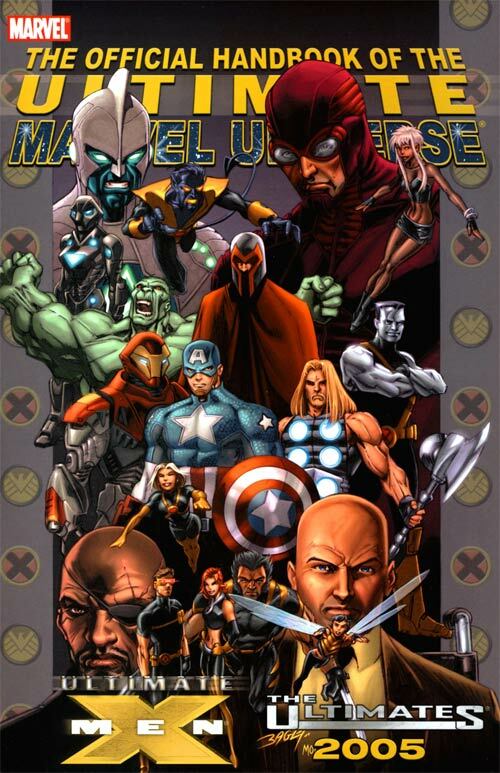 I know the original point of this storyline was to show the Marvel Movie that could never be made. As it stars Wolverine, Daredevil and Spider-Man. I only own the final three parts, all of which, I plan on reviewing here. This is Bendis’ first time getting to write Kitty Pryde – not sure if he’s already a huge fan of hers or does that grow from this experience. I imagine he is like me, and is a life long fan of her. Actually, that will be the next issue, as she only appears this issue. This issue opens with Jean Grey having a vision of Wolverine in danger. Hell’s Kitchen. Wolverine is being shot at with adamantium bullets – a full decade before the Wolverine Origins film. Daredevil is not happy that all of this is happening in his neighborhood. I believe this is right before or at the beginning of Bendis’ multi-year run on proper Daredevil. Spider-Man shows up to save Daredevil, which he had the situation well in hand. This escalates to gun fire, which doesn’t thrill Daredevil – at all. I love Ultimate Spider-Man and Daredevil’s . . . chemistry, is the wrong word. Spider-Man, Daredevil and Wolverine get behind a car, to use it as a shield. Spider-Man makes a Butch and Sundance reference, which no one gets. I really like Finch getting a chance to draw these characters. The heroes get away and regroup. Daredevil wants Spider-Man to stop talking, it is messing with his heighten senses. 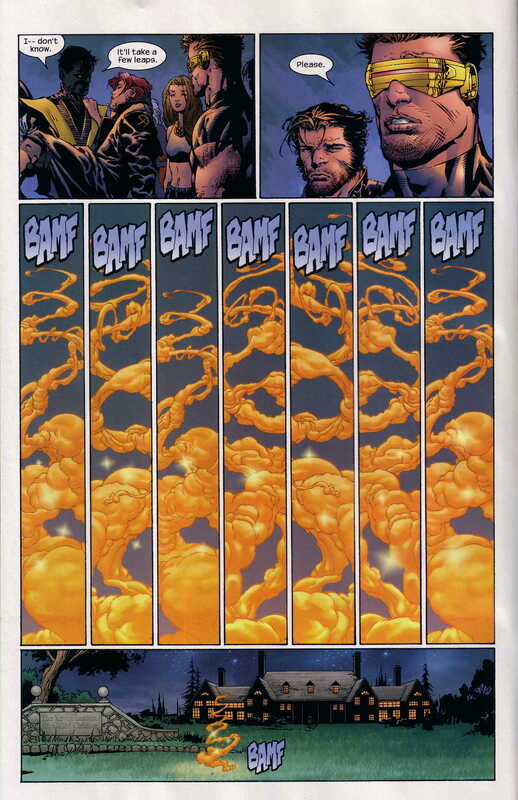 Wolverine finally gets the bullets out of his face, so his healing factor can kick in. Spider-Man comments that it gross to see and Daredevil doesn’t know what he is talking about. I don’t believe we get Ultimate Daredevil’s origins here, so I like how he is played for the mysterious new character but if you know who he is, that works as well. Bendis really knew how to write these Ultimate titles. As far as I can remember, his origin is essentially the same. I do like how Spider-Man and Daredevil are not the same age and how that changes their relationship. Spider-Man has all of these questions. Daredevil wants him to stop talking so he can hear the mercenaries. 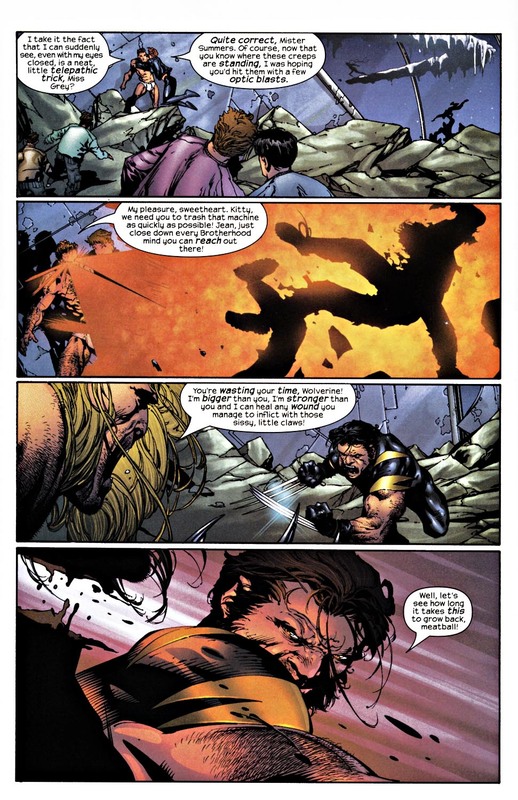 Wolverine is healed and can start participating in the discussion. 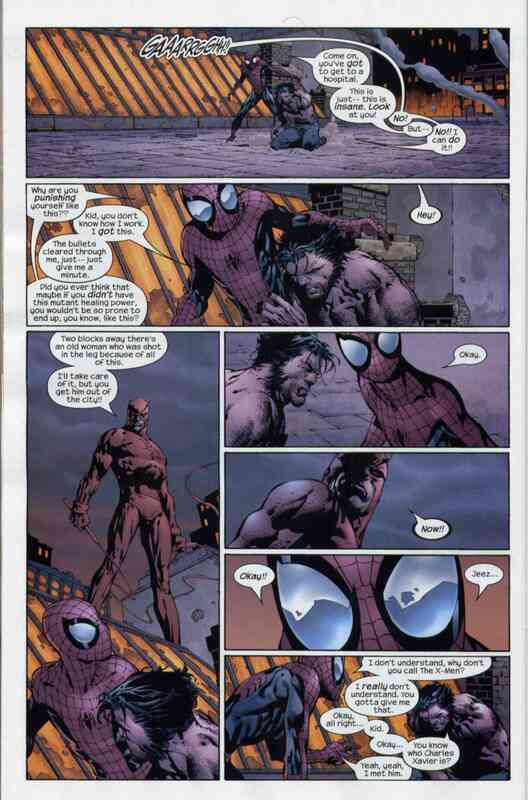 Spider-Man wants to know why Wolverine can’t just call the X-Men. Daredevil doesn’t recognize him from the X-Men. Spider-Man tells him that Wolverine is the hairy one. Everyone really comes off well here. Spider-Man is amazed that Daredevil can hear the whispers of the mercenaries. He could hear them better, if Spider-Man wasn’t shouting. Which he isn’t, which makes me think Daredevil is still new to his abilities. 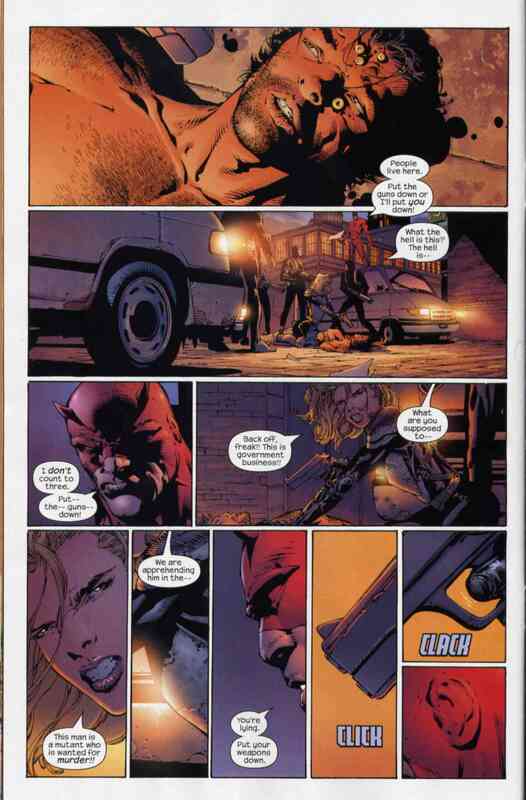 Daredevil knows the female leader is on the roof. Wolverine has Spider-Man take him up there. 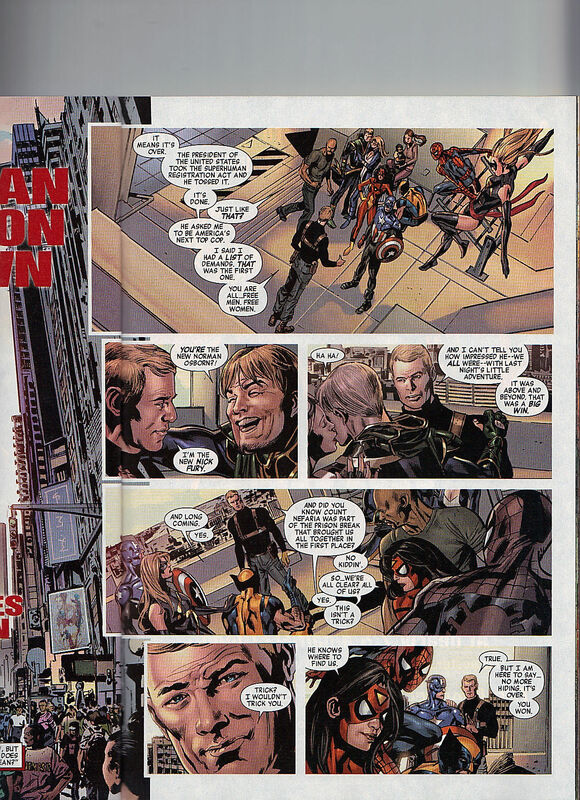 There is an ad for Amazing Spider-Man 500, to give you an idea how long ago, ten years is. Wolverine confronts her, she tells him she is his wife. She gets away as he is stunned by this information. She then starts telling him that she is his mother, next, cousin and finally, sister. She is just screwing with him. Daredevil tells the other two that a woman has been shot because of this nonsense. Spider-Man keeps asking why Wolverine won’t call the X-Men. We get this great page explanation. Wolverine remembers nothing prior to the metal claws. He knows he isn’t a good man, from even before the procedure. Once he met Xavier, he doesn’t want to tarnish Xavier or his school. My favorite part is when Wolverine explains how he feels responsible to fix the situation. He asks if Spider-Man can understand that. Spider-Man’s ‘kinda’ reveals so much with where Peter’s head is. As Wolverine is about to pass out, Spider-Man wants him to promise not to get mad. Because Spider-Man called the X-Men, as the issue ends with the X-Men showing up! I know that artist got away from this but I do like how Kitty is easily recognizable with how she has freckles and brown hair. So the next issue should be pretty awesome! I don’t remember the trade for this at all! Not to get all Kelly Thompson here, but who designed the X-Ladies’ uniforms? Had to be Xavier, right? He gave the guys full body outfits but the gals have to go running around, revealing their midriffs to anyone with eyes. It isn’t great. At least Storm has the good sense to put a jacket on. Back cover ad is for Apple Jacks, a cereal I keep meaning to try again. The ad is for a box with nothing but red Jacks, if you found it, you would have gotten some sweet money! My problem has always been, how do you know who won these things? They never tell you that. Are the winners listed somewhere?